Home > Pain Relief > Which Drugs or Foods React With Analgesics? The potential risks are manifold when an individual does not know which drugs react with each other and which types of food react with certain medicines. A patient can be susceptible to severe reactions, particularly when taking a separate drug alongside a current prescription. In some cases individuals may cancel out the remedial effect of their prescription due to ignorance of how food types and different drugs react with their daily dosage. Patients can, of course, rely on their GPs not to issue drugs that react with each other and to warn you off any fruit, veg, meat or fish that will affect or even subvert your prescription. Ignorance is not bliss, so it always helps to find out that little bit extra to ensure the drugs do work. What Are Analgesics Used For? Analgesics, painkillers by any other name, are ultimately a range of drugs including aspirin and paracetamol which are used to relieve everyday aches and pains, fever or inflammation. These less powerful types are known as compound or combined analgesics, but the range can also include opioids, also known as narcotic analgesics, such as codeine and morphine. The mechanisms of how analgesics relieve pain within the body depend on the type of painkiller used. When tissues are damaged, they produce chemicals that send signals to the brain via the nervous system, which in turn creates the sensation that we know as pain. Different analgesics will tackle this process in different ways. Painkillers are proven to work effectively on this process, but an analgesic such as aspirin will react with excessive amounts of alcohol, causing bowel problems.But with some painkillers such as ibuprofen, taking it with food or milk actually aids indigestion of the drug. Many health groups such as MedInfo also advise taking aspirin after food. When taking aspirin to prevent heart attacks or strokes people should be aware that ibuprofen and other painkillers called non-steroidal anti-inflammatory drugs (NSAIDs) will eliminate the protective effect of aspirin. 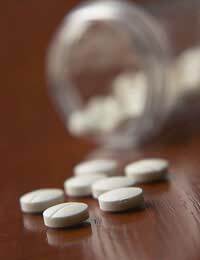 NSAIDs can irritate your stomach, causing indigestion, ulcers or bleeding. It is always advisable to avoid taking two different types of painkiller at once. If a variety is taken simultaneously, a person can start to suffer the intense pain of stomach bleeding or an ulcer.Steroids or drugs that are used to stimulate cortisone can also cause problems if taken with analgesics and they heighten the risk of stomach problems, particularly when consumed with aspirin. Anticoagulants, which are used to thin the blood to prevent clots from forming in the body, effectively stimulate the action of aspirin and paracetamol, particularly if the dose of painkiller taken is higher than that recommended. If you suffer epilepsy and take regular medication such as phenytoin, your doses may need to be reduced if you are taking aspirin. One of the more dangerous medications to take alongside analgesics is lithium; it is imperative to speak to your GP before taking aspirin at the same time. Doctors can advise about any of these risks and their guidance will act as a vital safety cushion.